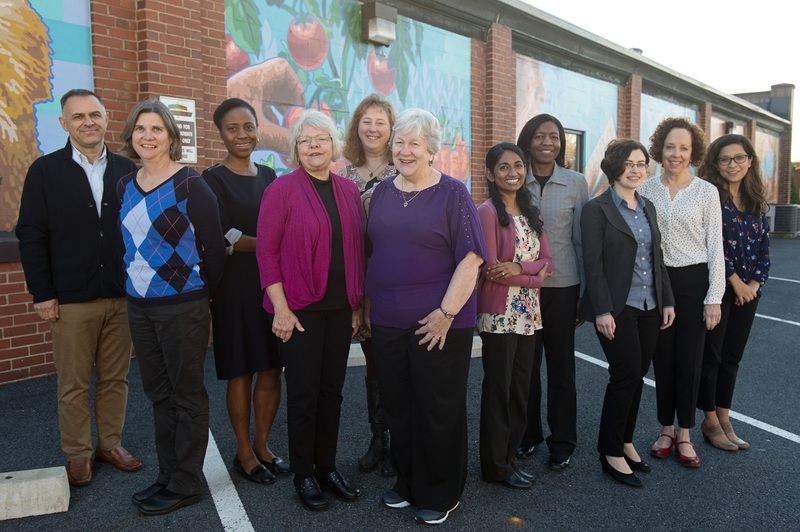 From left: Dr. Abdullah Sakarcan; Penny Porter, nurse practitioner; Dr. Abimbola Ajayi; Gloria Hutzell, nurse practitioner; Adrienne Salaneck, nurse practitioner; Dr. Eve Kimball; Dr. Vaishnavi Harding; Dr. Desiree Mae Williams Webb; Dr. Anna Karasik; Susan Yoder, nurse practitioner; Dr. Shilu Joshi. Not pictured: Jan Jackson, nurse practitioner and Tatiane Reyda, nurse practitioner. An innovative, quality-focused practice that has been committed to the health and well-being of children in the Berks County community for almost 30 years is now part of Penn State Health Medical Group. The approximately 60 employees of All About Children Pediatric Partners (AACPP), P.C., including 12 physicians and nurse practitioners, were welcomed into Penn State Health today at an event that also celebrated the practice’s new name: Penn State Health Medical Group – All About Children. Becoming part of the Penn State Health network allows the practice to offer local residents enhanced access to comprehensive care for their children close to home, in coordination with Penn State Health St. Joseph and Penn State Children’s Hospital in Hershey. Featuring the region’s highest level NICU and only pediatric trauma center, the Children’s Hospital offers advanced and specialized care to young patients across central Pennsylvania. Penn State Health will collaborate with the practice to continue the holistic family-focused care its patients and families have come to expect. Since its start by Dr. Eve Kimball in 1991, AACPP has been recognized in Berks County as a resource for children with special issues and abilities, including autism, diabetes, mental challenges, asthma, cystic fibrosis and others. The practice has participated in a variety of quality initiatives, including the governor’s Chronic Care Initiative and American Academy of Pediatrics Quality Improvement Innovation Network on Child Abuse, and collaborative research projects with academic organizations on issues of prevention, such as asthma, newborn screening, oral health and genetics. The combined experience of the practice’s pediatricians and nurse practitioners totals more than 300 years caring for children in Berks and all over the world. The practice at 655 Walnut St. in West Reading sees 15,000-17,000 patients each year in a 16,000-square-foot, state-of-the-art facility known for both its technology and its integration of local community culture. The facility was designed with infection-prevention strategies such as direct exhausting of air from patient areas to the outside, a separate waiting room for infants and children with special healthcare needs and 28 exam rooms.